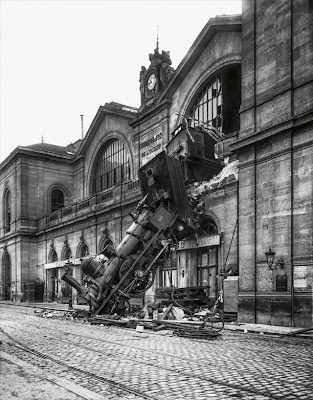 Taschen has had its way with me again. This time it's Paris: Portrait of a City, a voluptuous oversized volume of photographs of the city of my dreams, a visual feast covering 150 years of Parisian history and culture that put me in a prolonged trance-like state. Glancing at my notebook afterwards, I saw that I had jotted down notes about so many events, artists, writers, photographers, entertainers and architecture that I had almost re-created the index -- that's how rich this book is. 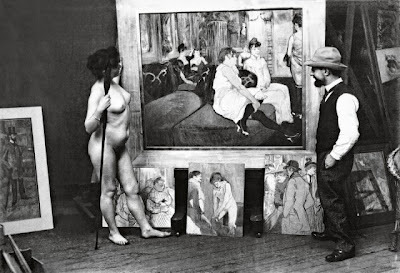 We see a photograph of Toulouse-Lautrec surrounded by a grouping of his paintings and a naked prostitute in the bordello he frequented; Brassai's portrait of a beautiful young Salvardor Dali in his studio; Man Ray's group portrait of the "Bureau for Surrealist Research;" another Brassai of Pablo Picasso in his studio seated next to a huge pagoda-like potbellied stove; and Edward Steichen's portraits of Rodin and Matisse with their work. Toulouse-Lautrec in the bordello he frequented in Rue des Moulins, shown with his paintings of its “residents”, 1894. © Bibliothèque nationale de France. We see an 1855 photograph of construction on the Louvre Palace, on the order of Napoleon III who decided to connect it to the Tuileries Palace making it the largest palace in the world. A 1942 image shows empty frames hanging in the museum, artists' names and titles chalked on the wall behind them, their contents having been removed and stored in a secret location when war was declared. A four-page fold out shows the successive stages of construction of the Eiffel Tower; while the endpapers show a more modern view of the tower, Frank Horvat's 1974 Shoe and Eiffel Tower, the tower itself dwarfed by a woman's ankles and shoes. There is an eerie black and white photo of Hitler posing in front of the tower during the German occupation. More upbeat images show a woman hanging precariously on the edge of the tower, skirt flared out in the wind, while another captures the tower in silhouette against fireworks during the 1989 Bicentennial of the Revolution. There is Nadar's first aerial photo of Paris taken from a balloon, the first ever photo taken with a Kodak/Eastman camera, Lee Miller's Paris in the Snow, Cartier-Bresson's Behind the Gare Saint-Lazare, and Rene Jacques' The Tarring Machine with its ghost-like image of Notre Dame in the background framed between two lamp posts. Coco Chanel, Kiki de Montparnasse, Josephine Baker, Brigitte Bardot, Collette, Bijou, Zsa Zsa Gabor, Sarah Bernhardt, Simone de Beauvoir, Lauren Bacall, Humphrey Bogart, Jean Renoir, Balzac, Orson Welles, Sartre, Yves St. Laurent and Karl Lagerfeld are all represented. We see the Moulin Rouge, Cafe Les Deux Magots, dirigibles, balloons, expositions, revolutions, occupations, celebrations and much much more. 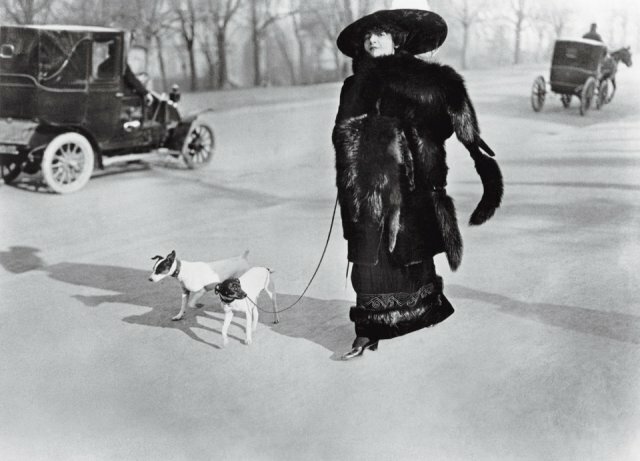 The actress La Pradvina, Avenue du Bois de Boulogne, 1911. Photographie JH Lartigue © Ministère de la Culture-France/AAJHL. The 500 photographs are accompanied by an index of the more than 150 photographers' biographies. Essays by editor and author Jean Claude Gautrand, one of France's distinguished experts on photography, in English, French and German round out this amazing book.